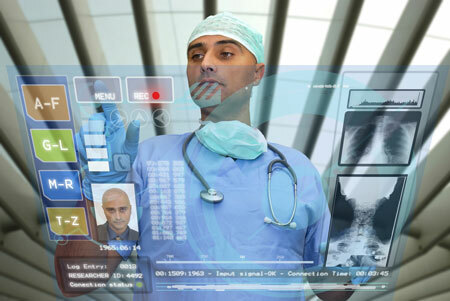 Modern medical systems are nowadays based more and more on the easy access and real time processing of a great amount of data and medical information characterized by certain grade and type of structuring. Understanding the major importance that electronic data base systems have for the medical informatics systems led to their quick worldwide adoption, the concept of electronic database evidence has suffered many transformations and reconsiderations along with the increase in complexity and with the change of medical data, simultaneous with health care systems evolution. The sharing of patient information between health care organizations and IT systems is changing from a “point to point” model to a “many to many” one. “Collection of computerized information referring to the health state of a certain subject stored and transmitted in complete safety, accessible to any authorized user. It has a logic pattern for information organization implemented, universally accepted and independent from the system. Its main aim is to assure continuous, efficiently and quality integrated health services along with retrospective and prospective information “. What is electronic health record (EHR)? An electronic health record (EHR) is an evolving concept defined as a systematic collection of electronic health information about individual patients or populations. It is a record in digital format that is theoretically capable of being shared across different health care settings. In some cases this sharing can occur by way of network-connected enterprise-wide information systems and other information networks or exchanges. EHRs may include a range of data, including demographics, medical history, medication and allergies, immunization status, laboratory test results, radiology images, vital signs, personal stats like age and weight, and billing information. Information about visits to health care professionals. Information about any conditions or diseases. Information about any surgeries or procedures performed. Medical history, examination and progress reports of health and illnesses. Medicine and allergy lists, and immunization status. Medication information, including side-effects and interactions. A record of appointments and other reminders. What is the business of EMR? The following three stages of economic return helps to decide whether there is a business case for a particular electronic medical records system. The first stage is characterized by operational efficiencies and workflow automation achieved through process re-engineering and faster access to accurate information. The benefits gained in this stage include reduced overhead costs and professional liability rate reduction. The second stage, benefits are derived from increased clinic productivity and decision support at the point of care. As more information is entered into the EMR, standard care protocols, order management, and outcomes analyses can be supported. EMR customers experience quality improvements, compliance with regulatory requirements, and reduced exposure to risk. Thirdly the longer term, investments in EMR software systems can provide health care organizations with a distinct competitive advantage. Looking forward, physicians should anticipate using an electronic medical records system as a tool to manage the business of delivering care efficiently and cost-effectively, and to provide more responsive care to an increasingly selective consumer. What are the business and social benefits of digitizing medical recordkeeping? Decreased probability of unnecessary treatments and tests. Digitizing medical records can save lives as well by catching Prescription errors like misdosing and drug-drug interactions. Electronic medical record improves medical services by making them faster and patients have less stress. Doctor can make prescriptions make appointments and referrals at the same time through the digital EMR. EMR may help patients to get access to personal health records conveniently on workstation and even on the mobile Phones too. EMR can cut down the cost by reducing less paper work. Data can be very well protected with the EMR. Up to date record maintenance is easier with the use of EMR. Information should be able to be continuously updated. The ability to exchange records between different electronic health records systems (“interoperability”) wouldhelp develop a network between healthcare deliveries in non-affiliated healthcare facilities. In healthcare, interoperability refers to the ability of different information, technology systems and software applications to communicate, to exchange data between them, accurately, effectively, and especially to use the information that has been exchanged. eMorphis is a global specialist, providing software product/application engineering services to Independent Software Vendors (ISVs), software enabled businesses and companies that work on embedded software.Our clients partner with us to achieve their business goals. eMorphis is a boutique technology company with experience & expertise on various Technologies like .Net, J2EE, PHP, iOS, Android etc and Cloud Computing like Amazon Web services (AWS), Software QA & testing (Manual & Automation). We design Products which are cloud ready and can be deployed on AWS/Azure like cloud infrastructure. Our focus on engineering innovation and R&D help shorten time-to-market, ensure higher quality at low cost, and delivers greater innovation to compete in a global marketplace. We ensure that your ideas and requirements are backed by brilliant execution. And we extend end to end ownership of your product/application design, development and deployment.